Scientists working in Argentina have announced the discovery of a new, large, meat-eating dinosaur that was even larger than Tyrannosaurus rex. Furthermore, researchers believe the animal may have hunted its prey in packs. We now have complete model, size, scale, and pricing information available on our popular Model Kits. These kits are shipped unpainted for you to put together yourself. Save and learn about your favorite dinosaurs with a CM Studio Model Kit! One of CM Studio's recently completed installation. . Above: Great panoramic exhibit photo. CM Studio's life-size sculptures come to life. 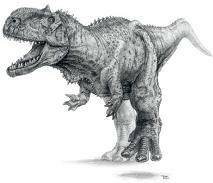 Here we see an Allosaurus. 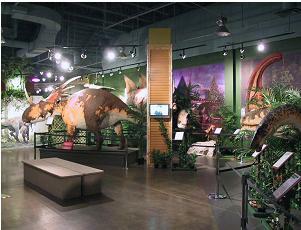 Another photo of the historical and educational exhibit. 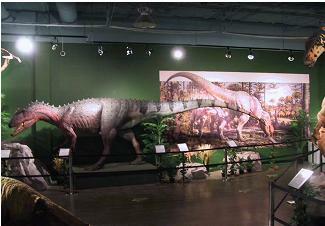 Currie said that the Mapusaurus roseae may have been able to hunt the largest land animal ever to walk the earth, the 100-ton Argentinosaur which grew to as long as 125-feet long. Scientists are hopeful they can find additional Mapasaur specimens in the future that will tell them more about this giant predator. Palaeontologists have uncovered the first dinosaur remains in Lebanon, adding evidence to the theory that millions of years ago the Middle East was covered with forests where giant reptiles roamed. A stocky, carnivorous dinosaur with an unusual head crest has been identified from bones collected in India. American and Indian scientists, working with support from the National Geographic Society, have named the animal Rajasaurus narmadensis. Dinosaur Discovered in Patagonia-Named "Small Head"
Argentine paleontologists have discovered a 13-foot (4-meter) plant-eating dinosaur with a long neck and small head that roamed the southern tip of South America about 70 million years ago.